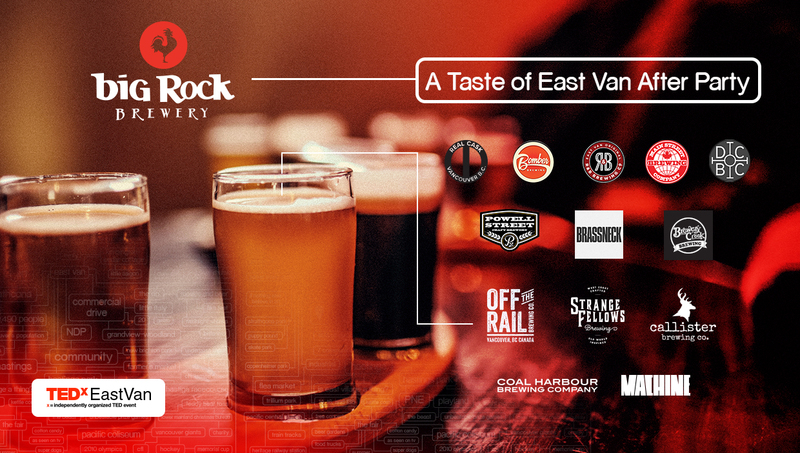 TEDxEastVan is happy to announce that the official After Party will be held at Big Rock Urban Brewery (310 W 4th Ave.) immediately following the event - providing exclusive access to TEDxEastVan ticket holders from 5:00-7:30 pm. Due to successful partnerships and the collaborative nature of East Vancouver's craft beer businesses, the party will be attended by and feature beers from 13 East Vancouver breweries including: R&B, Bomber, Off The Rail, Coal Harbour, Doan’s, Powell Street, Callister (which includes Brewery Creek, Machine Ales, and Real Cask), Strange Fellows, Brassneck, Main Street and our hosts, Big Rock. The Taste of EastVan After Party is free for all TEDxEastVan ticket holders and includes free beer tastings and appetizers until 7:30. One-way transportation will be provided for those participants that require it from the York Theater to Big Rock Urban Brewery. In order to keep the conversation going and broaden the TEDxEastVan experience, guests will include TEDxEastVan speakers, brewers, event partners, and the conference organizers. Live musical talent and professional contemporary dancers will entertain guests throughout the evening. After 7:30 pm guests are invited to stay, enjoy the entertainment and continue to sample the array of East Van beers that will be on sale all night. * Please note, transportation will not be provided back to the York following the Taste of EastVan After Party.